I have been enjoying seeing what all comes up in my new yard this spring and summer. I consider every single blossom a gift, since I didn't plant them, but nevertheless, here they are! The previous owners planted hydrangea bushes along our front walk. The bushes are almost as tall as me! (Perhaps they have actually been neglected and need to be tended.) But being so high allows me to see the blossoms from inside the house through the windows and I consider that an advantage. The flowers on the bushes turned from bright white to a delicate violet that subtly grows more saturated with color by the day. I indulged myself and cut the largest of all the blossoms off and brought it inside to my kitchen table. I didn't know how well it would keep, but I've had it there for a few days now, and it is still fresh and beautiful. Tiny bluish blossoms drop onto the table from the underside of the flower throughout the day, but since I wipe my table free of crumbs once or twice a day as it is, because of my kids, this is no real inconvenience. Hydrangeas have been a favorite of mine since my teenage years when I saw them in my friend's bridal magazines. So when I got married, I ordered them to go in my assorted wedding bouquet. 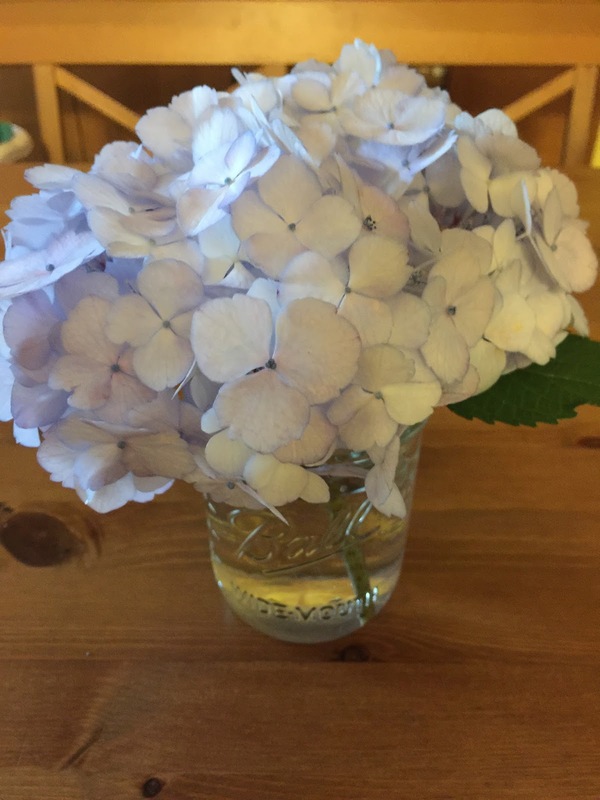 Back then, I lived in the south and hydrangeas are not common down there, so it was a mystery to me how these flowers even grew! But they are everywhere in New England and it is a joy to have full grown bushes of my own now!